You are gonna wanna head over to Little Miss Muffet today, as we have a pretty mahoosive release, a Friday Freebie and a Sunday Spotlight to catch up with, and Barbara reveals the new look Store. She's been working on it for months and it looks great. 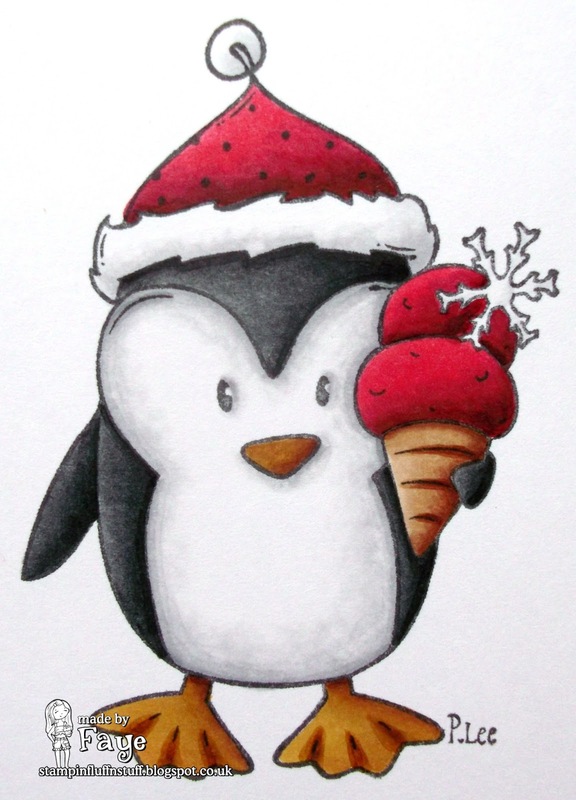 This cutie (and we all know I have a soft spot for penguins, both real and choklit) is Dexter's Ice Cream. 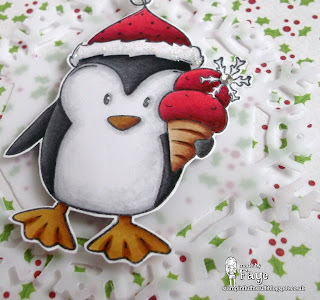 I had big plans for him, involving some lush ice cream paper I've been holding onto for such an occasion, and a 'Penguin is, not just for Christmas' message. But I coloured the ice cream (and hat) to match the ice cream on the paper, and as soon as I'd done that, Dexter didn't look right with the ice cream paper anymore. So, Peeps... Penguins... Not For Ice Cream Paper! What a cute penguin! gorgeous card Faye. He is a cutie pie! Definitely not in the cutesy way either so he looks great against those papers - no cones needed ;>) I am a fan of penguins too! Very cute card and beautifully coloured ! cute little penguin with his berry ice cream - mmmm! Oh my gosh love that little guy! AWWWWWWW I love that cute penguin so much and your colouring had really bought him to life. I wish he was a digi stamp, I'd buy him straight away! He is just too cute!! The papers and humungo snowflake are perfect with him!!! LOVE! 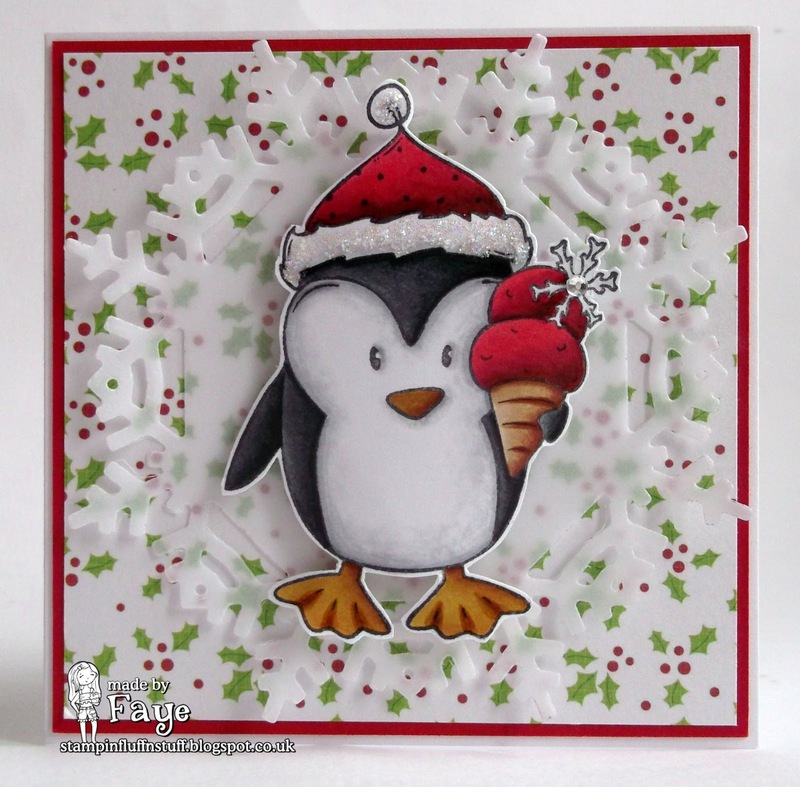 oh my word this is so cute..
Oh, loving that penguin Faye and the papers look perfect with him! He is adorable! Love the red ice cream! I think you ended up with a great choice of DP for this sweet penguin. I like how you placed him on top of that big die cut snowflake of translucent paper. The clean design works really well with the size of the image. He matches the berries now and just as fab. Hugs Muver. So gorgeous! I love Dexter.